EVO ix raises the bar - on indoor cycles and your cardio deck! Designed to be Seen: The Evo Fitness Bike is not meant to be hidden in a closet; the elegant cantilever frame design, unique color options and components, as well as the high tech feel of the Evo begs to be put center stage. The makers of the Evo Fitness Bike have used a half century of industry know-how to create the most comprehensive list of innovative features available on the market. 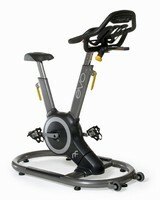 Both the Orb™ and RAMP™ technologies are exclusive to the Evo Fitness Bike, making this indoor cycle one of a kind. The elegant, cantilever frame design reflects the exclusive technology and the creator"s dedication to form and function. The Evo Fitness Bike is the perfect combination of advanced tech, good looks, and effective training, all geared to make your commercial setting stand apart from the rest. InfiniteFit™ Handlebars: Each Evo Fitness Bike comes with a standard, specially designed set of handlebars that allow for the four most commonly used hand positions. Click the button below to add the Relay Fitness - Evo ix Indoor Cycle to your wish list.